International Schools Visits Each year we host a growing number of International schools, some from other parts of Africa, a sprinkling from outside the UK and the vast majority from England, Scotland, Ireland and Wales. 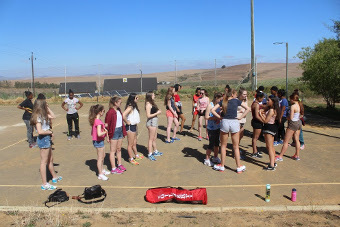 For three months of the year Goedgedacht rings to the sound of young people, singing, laughing, dancing and playing sport, helping out in a whole variety of ways. A wonderful clash of cultures. June, July and August are joyous months and we have come to look forward tremendously to these visits. You would not believe the tearful goodbyes we experience each year.